New Hope Network is a proud sponsor of both new survey research on the topic of building demand for regenerative agriculture and The Regenerative Earth Summit. Please consider joining us Nov. 6 and 7 at the summit in Boulder, Colorado, for an interactive, two-day gathering designed to explore the opportunity for regenerative agriculture. It’s time to change agriculture. Despite our best intentions, our agriculture and food system doesn’t seem to work as well as some had hoped. Norman Borlaug’s green revolution sought to increase food security around the world. The green revolution’s mix of high-yield, disease-resistant crops and modern, chemical-intensive agricultural techniques were well-intentioned and designed to solve the very real problem of feeding the world’s growing population and the food insecure. More than 70 years later, even with noblest of intentions, we are beginning to recognize the unintended consequences of our modern agricultural system, including polluted waterways, water shortages, nutrient-depleted soils and topsoil loss. Like 70 years ago, we face the challenge of feeding a burgeoning population. However, today we do so while grappling with the uncertainty of a changing and warming climate and the unintended consequences of chemically laden agriculture. There exists both urgency to act and opportunity to be had. 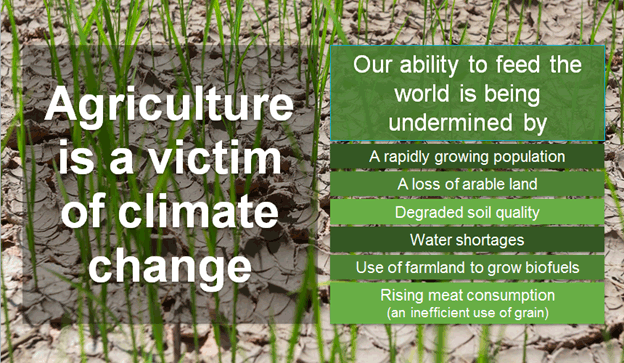 While many don’t realize it, agriculture is a major contributor to climate change. There is no doubt that our farmers want to be good stewards of their lands. Their livelihoods and their futures depend upon it. Yet, to many farmers and observers, it’s clear that our systems aren’t working as well as they could. However, swimming against the current created by the downward spiral of our chemical-intensive agricultural system can be difficult. The system does not do a good job of offering solutions to the problems that it has (unintentionally) created, and the prospect of walking away from the system that has been built and so widely supported over the last 70 years feels risky and uncertain. At the same time, we appear to be building momentum that will enable farmers to pursue more vibrant and regenerative approaches to production. Science, business appetite and consumer demand are growing behind the idea of changing our food system. There is excitement about driving a fundamental shift in how we produce food to solve major problems like climate change, nutrient depletion, water pollution and loss of top soils. Regenerative agriculture’s opportunities are emerging. Regenerative agriculture offers powerful solutions to the problems we face. If we look to our soils, we find a powerful ally in fighting climate change. 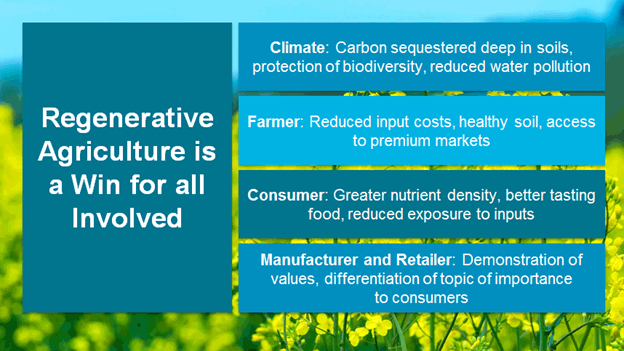 And thus, regenerative agriculture is the win-win-win for climate, farmers and consumers. But first we must engage parties across our food system to build the market. David Johnson, PhD, of New Mexico State University, estimates that if we would convert 22 percent of arable land to regenerative agriculture, we could capture all human-caused carbon emissions and return atmospheric carbon levels to preindustrial levels in about a decade. Restore balance to our climate. Adopt metrics to assess agriculture methods and individual farm progress. And maybe most importantly, create demand to build the momentum needed to convert our agricultural systems from one aimed single-mindedly at feeding the world’s population to one aimed at doing so while also regenerating our climate, farmland, businesses and health. If we are going to change the system, we need to give those farming our food ample reason to adopt new production methods. So the question we need to answer is: How do we build demand and a marketplace for regenerative agriculture products? To shift the system, many will expect farmers to change their ways. This of course will be necessary, but the whole food system—including consumers—for change. If a farmer is to risk transitioning his production methods, a robust reward must await. Healthier soils, lower input costs and decreased chemical exposure might be reward enough for many, but if a marketplace to sell higher-quality goods doesn’t exist, the economic incentive might not feel compelling enough to shift. Today we have an exciting opportunity to build demand for regenerative agriculture through the brands consumers buy every day at the grocery store. Consumer culture is shifting as shopper awareness and consciousness grows, driving increased engagement in how they become aware of, consider and choose which brands they purchase and make a part of their lives. Consumers are realizing their economic power. Empowered by their new awareness—and increased marketplace transparency and access to information—consumers now vote with nearly every dollar they spend. Simultaneously, worry about climate change grows among consumers. As an industry, we can connect climate concern to consumerism and the food we grow, manufacture and sell. It’s exciting to consider how we can to link consumerism to climate action through our brands. Historically, industry and activists have led the way on climate action. Citizens were given simple conservation efforts to fight climate change, suggestions such as: turn off lights when not in the room or shut off the water while brushing teeth. Or they’ve faced the unrealistic challenge of doing extraordinary things like rebuilding their lifestyle around public transportation or investing in expensive electric or hybrid cars. The climate movement has failed to give tangible actions the public can take to make a big impact. Industry needs to continue to lead. But if we are to solve or mitigate climate challenges, we will need to engage consumers through the brands they buy at the grocery store. And we will need to amplify industry impact through consumer spending. How changing consumer culture creates a unique opportunity for brands to differentiate on climate leadership and regenerative agriculture. How consumers engage in climate issues and spend on responsible products and brands. What education farmers, manufacturers and consumers need regarding the link between agriculture and climate change. The call for research and mentors to demonstrate regenerative agriculture’s benefit to farmers. The need for metrics to help farmers monitor regenerative ag progress, and investment in research and test farms to demonstrate improved profitability, yields and reduced costs. The promise of demonstrated market demand and multiyear contracts to support farmer transition. Join us at the two-day Regenerative Earth Summit in Boulder, Colorado. Fellow influencers, innovators and leaders in the natural and organic food space, regenerative agriculture movement, soil carbon sequestration community, farmers, investors, local food and civic leaders will work across sectors to build strategies and storytelling that drive adoption of practical, regenerative agriculture methods in our food system. This interactive gathering is designed to explore the opportunity for regenerative agriculture while co-creating an ecosystem of peers across multiple disciplines to work together to discover and devise how we can collaborate in service of our shared vision for a vibrant, regenerative and health-affirming food system. Register here to join us in our collective effort to recreate our food system with the goal of nourishing our communities, protecting our natural resources and mitigating the effects of climate change.